Whenever you take a new pet into your home, you want to be aware of prospective health concerns that could arise. And, as owners of any other pet might be concerned about, you want to know what vulnerability your hamster has for contracting rabies. We have carefully and thoroughly investigated this matter to answer all the questions you have about your hamster’s susceptibility to rabies. Fortunately, while all mammals can get rabies, it’s extremely rare in small mammals like hamsters. Unlike dogs, cats, and other larger mammals, cases of rabies in hamsters are virtually unknown. This doesn’t mean that hamsters cannot get rabies, but it does mean that this is not really a concern for you and your furry friend. While hamsters are not common carriers of the rabies disease, it is not impossible for them to contract it. In case you’re still worried, in the sections below, we will detail how hamsters can become diseased, what the signs and symptoms are, and what you can do to prevent your hamster from becoming rabid. How Does a Hamster Get Rabies? 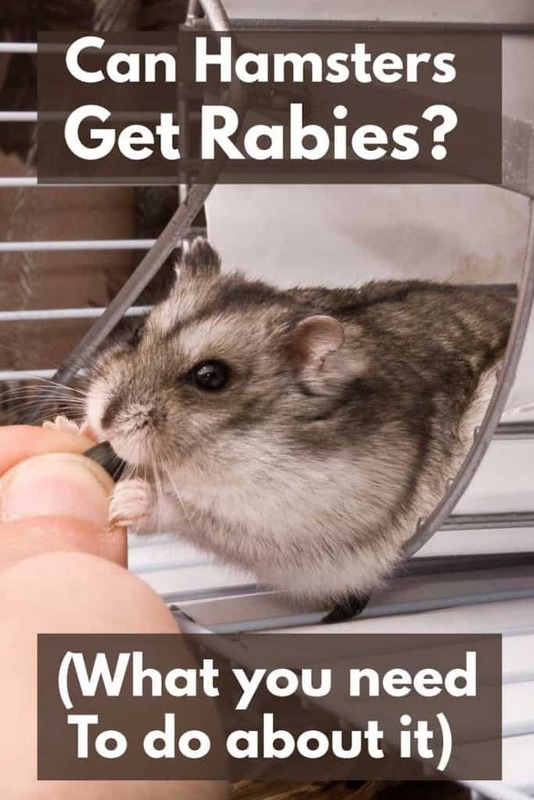 Though the CDC states that hamsters are an incredibly unlikely host for rabies, there are certain circumstances that could lead to a rabies occurrence. The most common cause of this uncommon hamster disease is when a hamster is bitten by a larger, infected animal. One thing to consider is that hamsters are not likely to survive a bite from a larger animal in the first place, whether rabies is present or not. Consider how much smaller a dwarf hamster, for instance, is when compared to even the smallest of dog breeds. A bite from an aggressive, larger animal is more likely to inflict death than rabies itself. What are the Symptoms of Rabies in Hamsters? Rabies cannot be determined through a visual inspection of a hamster’s appearance and behavior with 100% accuracy, but there are some signs and symptoms that you should be aware of. Again, it isn’t likely that a hamster that’s been bitten by a rabid animal will survive long enough to display these symptoms. Still, it is not impossible, despite the rarity of these symptoms appearing in hamsters. The first symptom that presents itself in the event of a rabies contraction is a sudden change in the hamster’s demeanor. He or she may appear dull and sullen for a period of time before suddenly becoming frantic and aggressive. During this time, they may bite at anything and everything around them, including their owners. During this aggressive period of the disease, the hamster may also begin to make strange sounds when in the throes of biting. They might make aggressive sounds that you have never heard before or start squeaking loudly and more incessantly. Partial paralysis is a possibility in these rare cases, typically in the hind legs. If paralysis is present in a rabies infection, it will gradually move along the hamster’s body until its neck, throat, and jaws become paralyzed. There is also the possibility of the characteristic “foaming at the mouth” that is so often associated with rabies. Your hamster may appear to be frothing at the mouth and may dribble excessive amounts of saliva. A rabid hamster may also become hydrophobic, meaning that they become afraid and avoidant of water. This means that they will likely avoid drinking as they normally would. This hydrophobia can also contribute to the excessive drooling and foaminess that appears around the mouth. If your hamster has displayed any of these symptoms, especially right before their death, and you have been bitten you should seek the aid of a medical professional. A veterinarian will be able to accurately determine whether or not rabies was the cause of death for your hamster. How Can I Prevent my Hamster from Getting Rabies? A healthy and happy hamster will remain that way for as long as they aren’t exposed to other animals that could be rabid. So, the best thing that you can do to prevent your hamster from contracting rabies is to make sure that they are safe. Ensure that he or she cannot escape from their cage and get out of the home, where their potential exposure increases. Area wildlife, like bats, rabid dogs, and raccoons, could come across your tiny companion and give them the disease. If you have another pet, like a cat or dog that could have been exposed, make sure to keep your hamster free and clear of them. Until the other pet is deemed free of rabies, your hamster should not be placed around them in any capacity. Avoid hamster balls, which a hamster can possibly escape from until your other pet has a clean bill of health. Typically, hamsters are not vaccinated against rabies. If you are exceptionally worried about your hamster contracting this disease, discuss with your veterinarian about preventative steps. Could my Hamster Give me Rabies? It is possible for a human to become host to rabies if they are bitten by an animal that already suffers from the virus. Hamsters are not excluded from this fact, despite how unlikely it is for them to have it. The aggression that is trademark to this disease can lead them to bite their owners. However, there are many circumstances that could prompt a hamster to bite. If they are stressed or sick from another condition, they could bite you if you try to handle them. Being bitten by your hamster is not, in any way, indicative that they have contracted rabies. What is the Prognosis if my Hamster has Rabies? Unfortunately, hamsters that have contracted rabies are not going to survive the disease. Rabies is a viral disease that aggressively attacks the central nervous system. The prognosis for a hamster with rabies is certain death. Hamsters and other small, warm-blooded mammals are very, very unlikely to ever contract or spread the rabies disease. 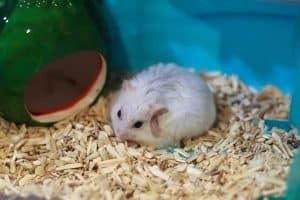 If your hamster has been acting strangely, it is more likely to be caused by any number of other health concerns, like the ones listed here. 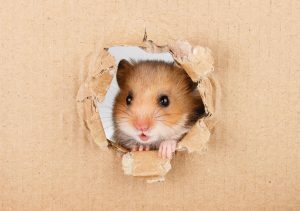 Many first-time hamster owners might become immediately worried about the possibility of rabies if their hamster unexpectedly bites them. If you are one of these folks, rest assured that rabies is exceptionally unlikely to occur in hamsters. Most countries of origin for hamsters have very strict criteria regarding disease exposure before mammals can be sent to other regions of the world. Hamsters sold by breeders are typically vetted by the breeders themselves and are not ever exposed to the disease. Even hamsters sold in pet stores and by backyard breeders are not likely to be rabid. Of course, it is possible for any warm-blooded mammal – hamsters included – to contract the virus. If you pay attention to your hamster under normal circumstances, you will be able to identify potentially problematic behaviors that could indicate rabies. If you believe that your hamster could have been exposed to rabies, consult your veterinarian right away. If he or she has bitten you in the time that you’ve become concerned about this, it is never a bad idea to seek medical attention. Now that you’re more relaxed about the possibility of your hamster contracting rabies, it’s worth mentioning the obvious: Vaccinate your dogs and cats against rabies. That includes cats that live exclusively indoors. Should you or any of your pet ever come in contact with a potentially-rabid pet or wild animals, talk to your doctor immediately. It takes a bite or a scratch that breaks the skin to transfer the virus – and if that happens, you absolutely should get a course of shots which will prevent the disease from taking place. Once symptoms show up, it would be too late, so do not delay treatment. Breathe easily in knowing that your hamster is much less likely to become rabid than any other mammalian pet that you could ever have. If they are exhibiting strange behavior or aggression, take them into the veterinarian. The diagnosis is not likely to be rabies, but something else that could compromise their overall health. Is It Ok for a Hamster to Eat Cardboard? Why Is My Hamster Going Bald?